When Milind from Piscataway first heard about Math Genie, he was a bit skeptical, as he had never heard of the program before. Intrigued he wanted to find out more. All of his skepticism flew out the window when he saw a young boy at the East Brunswick center doing complex math mentally. He was completely shocked, for the child’s ability to solve complex problems seemed too amazing, even orchestrated. After seeing this particular Math Genie student doing several random sums, he was stunned, and decided to enroll his on Rohan. he made quite a bit of progress and could do the computations he was given easily. Now, only in kindergarten, Rohan can do complex math computations (adding and subtracting), the kinds of computations that 4th graders are doing in India Milind’s native country. Since Rohan had was enrolled in Kumon when he enrolled in Math Genie. 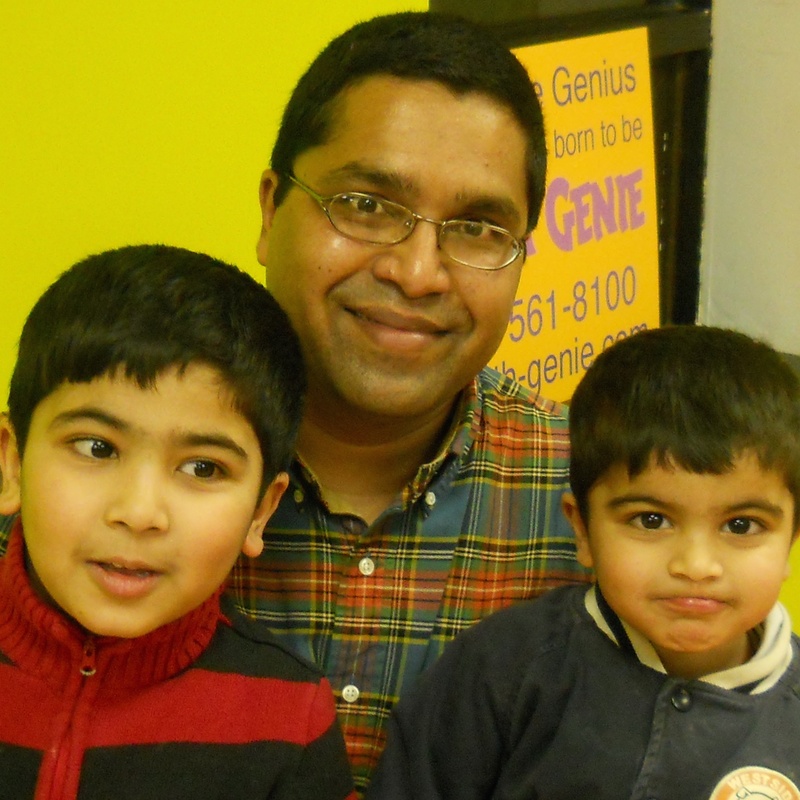 Milind saw a huge difference in the way that kids are learning math at Kumon vs Math Genie. Math Genie teaching method takes advantage of how a child’s brain thinks, where as Kumon seemed as if it were very repetitive and memorization-based. After just a few months at Math Genie, Milind and his wife decided that they saw much more potential in the Math Genie curriculum, and they chose to stop Kumon and continue at Math Genie. In our interview, Milind discussed some key differences that he has personally noticed between Kumon and Math Genie. The main difference is the way that math is actually taught at Math Genie. Children here are not just memorizing the calculations (such as 2 cows + 2 more cows = 4 cows). Milind recalls that the Kumon method seemed to be based on repetitive practice and the same assignments day after day. He says that this was not only boring for Rohan, but boring for them (as parents) as well. Milind says that at Math Genie, no sum is the same. The second key difference that Milind noticed is the teacher to student ratio and the quality of the teachers. He recalls that his son was getting much less personalized attention at Kumon and that the teachers seemed inexperienced. He says they may have even been high school students, with no teaching background at all. Milind recalls that the lack of experience may have led to a lack of patience in the teachers. When coming to pick his son up from Kumon, he recalls that the teacher would often say things like, “He was not able to focus very well today.” He felt as if they were just making excuses and making it seem like those days were just “bad hair days” for his son. At Math Genie, he has seen a huge difference. He is very impressed with the pool of teachers, and this is mainly because of the experience that they possess. He says that the Math Genie teachers he has trusted his son’s learning to seem extremely concerned with the progress of each and every child. When Rohan does not understand a new concept, the teacher will help him understand. The teachers at Math Genie pay special attention to help each child focus better. When he asked Rohan’s teacher how she always has a way to help Rohan understand a concept better, she says that she just uses a “toolbox” (a figurative one, not a real one) in her head. This “toolbox” allows her to have plenty of different ways of approaching the same concept. No day was simply a bad hair day for Rohan, and there were no excuses for teachers to make.